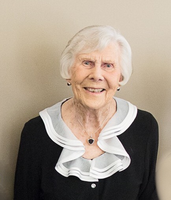 It is with great sadness that we announce the peaceful passing of Ailene at Amica Peel Village on March 24, 2019 in her 95th year. Loving wife of Keith Blair (1971) and Joseph McLinden (2007). Beloved mother of Barbara (William) Chauvin, Madison WI; David (Barbara) Blair, Brampton ON; cherished stepmother of Peggy (Neil) Murphy, Victoria BC; Joseph (Nancy) McLinden, Lakefield ON; and Michael (Catharine) McLinden, Kimberley BC. Proud grandmother to Mark (Diana) Chauvin, Minneapolis MN; Jeffery (Jessica) Chauvin, Rochester MN, Scott Chauvin, Madison WI; Kevin (Debbie) Murphy, Victoria BC; Brian Murphy, Medicine Hat AB; Genna McLinden (1996); Morgan (Lacey) McLinden, Toronto ON; and Brooke (Jay) Rowan, Whitby ON. Caring great-grandmother to Julia, Naomi, Maria, Peyton, Brycen, Caden, Preston, Paxton, Van, and Eve. Ailene is remembered for her great love of golf, music and bridge. Consider providing a gift of comfort for the family of Ailene Elizabeth McLinden by sending flowers. We encourage you to share your most beloved memories of Ailene Elizabeth here, so that the family and other loved ones can always see it. You can upload cherished photographs, or share your favorite stories, and can even comment on those shared by others. May the family of Ailene Elizabeth McLinden please accept my sincere condolences hoping you find comfort in God's words at Acts 24 : 15 and Psalm 37 : 29.